Superbowl weekend is here, and every good Superbowl party spread needs good dip! This awesome game-day salsa from tailgating pro Taylor Mathis is sure to make the day’s highlight reel. If you like this salsa recipe and want to hear about more recipes like it, come meet Taylor Mathis at an author event at Foster’s Market in Chapel Hill, NC this Saturday, February 1 at 11:30 AM. Flyleaf Books will be on hand selling books, so you can plan a whole Superbowl menu from The Southern Tailgating Cookbook! Recipe from The Southern Tailgating Cookbook: A Game-Day Guide for Lovers of Food, Football, and the South by Taylor Mathis. Text and photographs © 2013 by Jeffrey Taylor Mathis. 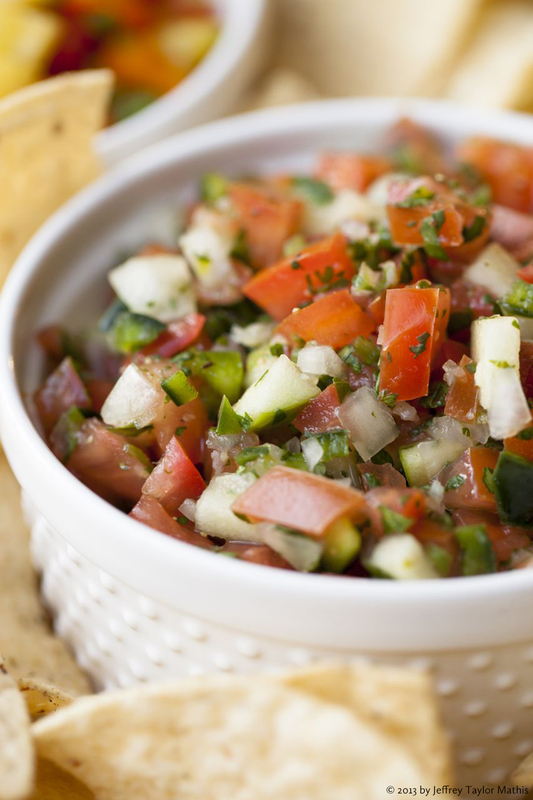 When you think of salsa, is pico de gallo the first kind that comes to mind? This combination of tomatoes, onions, and peppers works as an appetizer with chips or as a condiment for tacos and burgers. If you’re looking for a salsa that’s a little different from what you’re used to, try this one. It’s more tart than what you’ll find at most tailgates because of the Granny Smith apples in it. As soon as you’ve diced the apples, place them with the lime juice in a medium-sized bowl and stir. In a large bowl, add the rest of the ingredients. Stir in the apples and lime juice until all ingredients are evenly mixed together. Store in a sealable container and refrigerate overnight. On game day, keep in a cooler until ready to serve. Stir again before serving. Taylor Mathis is a food and lifestyle photographer, a blogger at Taylor Takes a Taste, and a passionate fan of all college athletics. He lives in Charlotte, N.C. Follow him on Twitter @taylor_mathis. What an clever idea! Will have to try this! « Beth Tompkins Bates: Will a New Detroit Rise out of the Depths of Despair and Hopelessness?